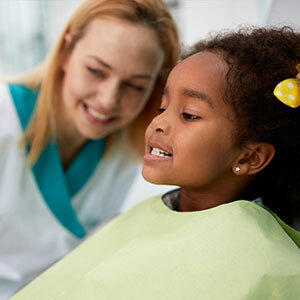 When does dental care begin for a child? In the truest sense, before they're born. Although the first teeth won't erupt until months after birth, they're already forming in the baby's jaw while still in the womb. During the prenatal period a baby's dental health depends on the mother's health and diet, especially consuming foods rich in calcium and other minerals and nutrients. Once the baby is born, the next dental milestone is the first appearance of primary teeth in the mouth. That's when you can begin brushing with just a smear of toothpaste on a toothbrush. Perhaps, though, the most important step occurs around their first birthday. This is the recommended time for you to bring them to visit our office for the first time. By then, many of their primary teeth have already come in. Even though they'll eventually lose these to make way for their permanent set, it's still important to take care of them. A primary tooth lost prematurely could cause the permanent tooth to come in improperly. Saving it by preventing and treating tooth decay with fluoride applications and sealants, fillings or even a modified root canal treatment could stop a bad bite and costly orthodontic treatment down the road. Regular trips to the dentist benefit you as a caregiver as much as they do your child. We're your best source for information about dental health and development, including concerns like teething and thumb sucking. We'll also keep you informed on your child's growth process as their teeth, jaws and facial structure develop. Beginning regular dental visits at age one will also help make your child comfortable with seeing the dentist, more readily than if you wait until they're older. It's an unfortunate fact that many people don't seek out the clinical dental care they need because of anxiety over visiting the dentist. Starting early, not only will your child be getting the best in dental care, they'll be developing a habit that can continue to benefit their oral health the rest of their lives.